Frozen and Precooked Weights Used, rather then weighed after cooking. I would like it if there is a new measurement, in which you select how much food weighs before you cook it, then you can measure everything beforehand. It's not really practical to measure food after you cook it. The cooking time could also be noted. For example. Broccoli cooked from fresh, baked, 15mins, 200oC, WBC. WBC = Weighed Before cooking. That way I know that if I take 50g fresh broccoli, weight it before cooking. That way it's much more practical. Everything would go cold if I measure it after cooking, and on top of this it's hard to buy food, then workout what weight it will be after cooking. It's fine if someone cooks massive amounts in batch. But for most people this isn't very practical. 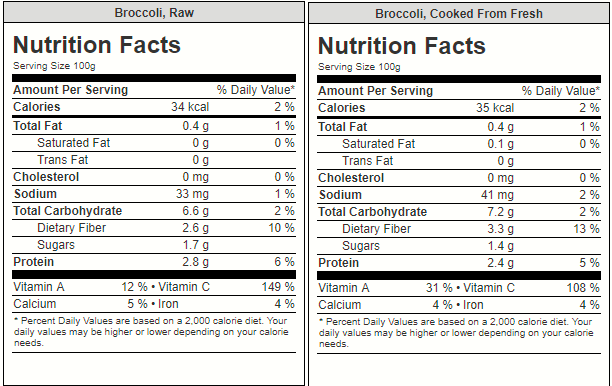 So the point is the nutritional values will show how much nutrition is in 50g of fresh broccoli. It could weight 20g after cooking, and the data will be given for 20g, but the measurement of how much it weighted before cooking is used. There could also be a WAC = Weighted After Cooking. For anyone that cooks in batch food, they can weight it after and know the nutritional values. I know this might seem over the top. But I prefer accuracy, and that data to be able to be used practically, otherwise we're back to guessing. Now I know there will be some inaccuracies, because people have slightly warmer ovens. Additionally some food might be fresher than others, or some frozen food might have more frozen ice on it. But it would be far more practical to do the measurements this way in my opinion. That way people can work out the costs better, and know that 100g of mushrooms baked in the oven, is going to turn in to about 20g cooked. Meaning if you measure 100g before hand then enter that in you get a massively different reading. Which I didn't realise this when I typed in a lot of values. I think it would be better to make this as clear as possible. So people don't make the same mistake. I know that might be confusing, but it's for sake of practicality. I think the reason why the USDA/NCCDB have not provided these measures is because food preparation methods and cooking times will vary in how much moisture is lost during cooking - affecting the weight of the cooked food. These variables can be very different from person to person, and the accuracy of assuming cooked weight from fresh weight may be low. I agree this would make carefully measuring my food intake much easier. You may be able to achieve this by measuring your fresh weight, then measuring your cooked weight the first time you prepare a food. Then, using that same cooking method the next time, you could be pretty confident that your values would be accurate. Thanks for the reply. You're right, but it is my fault for assuming the weight of the food wouldn't change much through cooking. I didn't realise there is such a huge difference. Frozen Broccoli went from a weight of 22g, Down to 8g, when baked. Which messed is nearly 2 thirds less in weight. I assumed it would weight nearly the same. It's a little bit upsetting because now food I thought is high in nutrition actually is very low in nutrition. Which means that raw food actually is probably a lot better to eat then cooked, simply because of the massive lose in nutrients and weight from cooking. Which confuses me because surely cooking would not remove nutrients much, yet if the weight has dropped so much, that would indicate the nutrients are being destroyed massively... but everything I read says the nutrients shouldn't be lost that much from cooking. So it's confusing? It doesn't quite add up. The biggest difference between cooked and raw foods will come from water weight. However, there can be differences in other nutrients as well. Some nutrients may be lost during the cooking process, but others become more available for digestion. You can use the Food Search in the Foods tab to compare the nutrient profile of cooked vs. raw foods. For example, 100 g of "Broccoli, Cooked from Fresh" and "Broccoli, Raw"
Not necessarily true. Think about it. If I have a fresh broccoli weighing 20g. Then I cook it and it weights 7g, then in 100g I have 14 pieces of Broccoli cooked. While I only have 5 pieces of broccoli uncooked. As in it's not that it's become more bioavailable, it's simple that 100g of broccoli cooked means more pieces fit in to 100g. So basically I eat it raw, I get more nutrients. The issue is it's harder to digest raw broccoli then cooked. But the point remains that actually I don't end up with more nutrients, but a lot less, and a lot more expense when it comes to getting the amount of broccoli needed to fit the nutrient requirements. so if we look at it like this vitamin A in 5 pieces of broccoli at 100g is less then 14 pieces of broccoli at 100g. So Vitamin A hasn't gone up in value at all. It's just not been lost in the cooking process. I did a quick calculation as well. I divided by 5 then times 14. There is slight lose in vitamin A through cooking. But not much, it's simply a case of broccoli weighs less after it's cooked. Given a person could then eat more broccoli since it's easier to digest. But I would argue that it would be more efficient to simply blend broccoli if it's an issues of digestion and keep most of the nutrients. To me this makes the most sense, since cooking seems to reduce weight so much, unless I buy precooked food that weights just as much, it will cost me more, and I get less nutrients. Plus I think I would rather eat 5 raw broccoli pieces over 14 cooked. Ha. The USDA has data for yield after cooking and also retention data for nutrients and alcohol. Unfortunately the yield is for meat and poultry products only (the nutrient retention factor data covers a lot, lot more though). For the yield -- i.e. basically how much moisture they'll lose -- of vegetables you can, if you're dedicated, use The Composition of Foods book. There is also a British publication called The Composition of Foods (by McCance and Widdowson) that has information relating to nutrient retention and yield from various cooking methods. In my personal opinion it's adequate for me to just weigh foods before cooking. I'm aware that some (percentage of) nutrients are lost by cooking (heat, exposure to the air, exposure to light, etc all affect nutrient retention) and some others may become more bioavailable, but the difference is not significant enough for me and my diet to go to the extra effort of weighing cooked foods. I actually did measure mushrooms, before and after baking, and broccoli. Frozen Broccoli went down in weight from 22g to 8g. That is a huge drop in weight. It's not a small amount. I expected it to maybe lost a few grams. But not 14g of weight. I can only assume that as the water evaporates a lot of nutrition is lost, but it's then more bioavailable, but I also know blending makes it a lot easier to digest, and become more bioavailable and the water content isn't lost in a heat transfer. I thought about it, when wood burns it loses energy, if food cooks and breaks down, there is going to be energy lose as it breaks down. The worst part is that the mushrooms went from 30g to 5g. I couldn't believe it, before hand I thought I bet it's just shrinkage, as in they would get more caloric dense, but actually no. The water evaporating really does make the food lose a lot of weight and nutrition. It's the only explanation that makes any sense when I look at the data on cronometer. It doesn't make sense that numbers should go up in value really, so the only explanation is that for 100g there is more broccoli on the scales after cooking. So what this means to me is that it's better to buy precooked food in batch, or eat it raw and blended to get good value for money. In my opinion. I don't like this because a lot of my recipes I made a mistake of assuming the cooked weight is the same as precooked, and so now I have to correct those recipes, so they have the correct nutritional values. I also have to consider the volume of food as well. I see what you mean now regarding the broccoli entries. It's a bit weird and the values don't seem to make sense. I'll have to think about that!